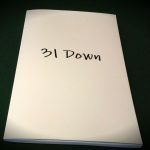 It was one year ago this month that I put out the 31 Down lyric book. It’s a small thing now that seemed like a big thing at the time. If you’ve seen and enjoyed one of the few copies that exist in the wild, would you mind dropping a star rating or short review (a sentence or two will do) at Lulu, where the book is available these days? It would help with visibility and giving people who haven’t been reading this site a better idea of whether the book is for them or not. If you want the lyric book and somehow still don’t have it, you can also order at Lulu. But I assume everyone reading this already knows that, what with all my nagging. Back to the usual nonsense in short order!